LONDON KY—On Tuesday, March 26th London Police Det. Stacy Anderkin, Det. Daniel Robinson, and Ofc. 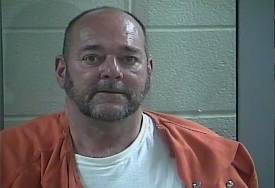 Eric Stallard executed an arrest warrant for Danny Christopher Farris, 57, of East Bernstadt, Ky.
Farris is charged with first-degree wanton endangerment, first-degree sexual abuse, second-degree cruelty to animals, and fourth-degree (domestic violence) assault with minor injury. The alleged incidents occurred from August 20, 2017 to August 24, 2017. He was lodged in the Laurel County Detention Center.